Mindscape in Words: 10 Reasons I Love Monsoons. Indian monsoons are the most amazing thing that a person needs to experience. The point when the constant summer heat is taken away drop by drop is so satisfying. I love how there's a certain calmness in the air and how beautiful everything seems after it has rained. I know it hasn't rained much this season, but one can always hope. People love and hate monsoons for a number of reasons. Here's why I love monsoons. First rain is remarkable as it changes the environment. It takes away the humidity leaving a subtle coolness. Once it starts raining, the trees appear greener, the roads appear cleaner and the people seem more refreshed. It's a season which brings out changes in nature. I love how it affects our surroundings leaving it in a bliss. For a girl like me, there's no other pleasure than sitting by the window, reading a book, drinking tea while it rains outside. 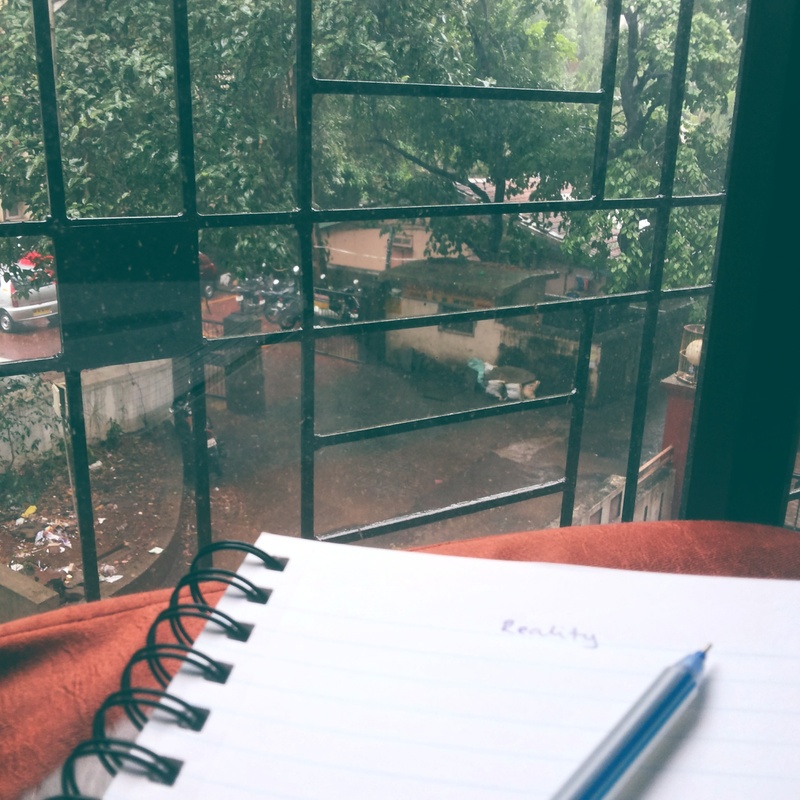 It's so much more peaceful to read during monsoons. It's obviously more fun to cuddle up in a blanket with a book in monsoons rather than summers. It's even more interesting when it's a love story as monsoons are romantic. When you just stand in your window looking at the rains, you're happy. You start thinking about beautiful things which you write down ultimately. Rains prove to be a great motivational booster for writers. One can even think about trying their hand at writing poems. Something in the air just gives you the push to write more. Rainy season is the favourite season for photographers, I think. Capturing rain drops on the leaves or kids playing with paper boats or a couple enjoying the season or rainbows is just too much to resist. There are so many wonderful things that can be captured during monsoons. I bet it must be absolutely fun to go on photo walks. But, of course, you need to take care of your camera from the rain. I know this from my experience that monsoons can be quite nostalgic. You see one thing after the other which takes you back in the past days. Because of monsoons, we cherish those thousands of memories. Monsoons have so much power that they can make us think and wonder. I don't think anyone ever is as nostalgic in other seasons as in monsoons. They also have another power of rendering us useless. We get a good excuse not to go outside and enjoy staying at home. Laziness gets the best of us in the rainy season. This is another major reason to love monsoons. That amazing smell when the rain drops hit the ground and leave us sniffing to that addictive smell of the mud. Everyone loves that smell and there's no reason to be ashamed of it. Because, as other reasons, monsoons can do that to us. Most people have stopped getting wet in the first rains because of the harm it can do to us. But, isn't there pure joy in just getting wet in the rain, no matter what? That feeling is so unmatched to anything else. Dancing in the rain or playing football is also so much fun. Driving during monsoon is also enjoyable. I know it can be risky, but that fun is immeasurable. There are these typical things we always do when it rains. How perfect is it to eat those onion pakodas with a cutting chai? Or eat that corn bhutta? They taste so incredulously tastier during monsoons. It's as if they're the official monsoon food. Monsoon entails some rainwear shopping. You can finally flaunt your colourful umbrellas, cool wind cheaters and stylish sandals. You could also buy water-proof makeup. Isn't that just another added advantage of monsoons? Monsoon is clearly the most romantic season of all. There's just some magic which comes with it that turns everything romantic. Couples just need an excuse to go on a weekend getaway. Even the single folks are happier while they watch romantic movies alone. It's totally the season of love. What's your favourite part of monsoons? Nothing like sitting by the window, watching rain pouring down outside. Great for inspirational writing. Oh man, I love monsoons also. I wish I lived in a place where they happened more often. Thunderstorms are the best when you are cozy in bed with someone you love. I always sleep better when I can hear rain, idk if I've ever been through anything defined as a monsoon but I think I'd quite enjoy it. I love curling up on the couch and reading a book while it rains. Love this list! I used to live in Arizona, which got beautiful monsoons. The desert comes alive with a sweet musty smell. Plus it's in summer so you can totally go swimming in the pouring rain! It's quite serene. I have also always loved monsoons! I've only been in a few but they were awesome. Cute post! Ever since I was young I have loved storms and rainy days. I really enjoyed this article and the pictures you painted with your words. The beautiful smell of mud and greenary everywhere! I love a good rainy day! Especially when you have no where to go. Thank you everyone for your lovely words.